My daughter researched and created her own rubber band loom iPhone case and coin purse. My eight year old daughter loves creating with her rubber band loom, but honestly, I haven't had time to encourage her hobby. Therefore, she has advanced almost entirely on her own. She saw this tutorial and thought it would make a great gift for grandma. So she watched and followed the steps to create an iPhone case. While creating the case, she noted that the rubberbands looked a lot like knitting and purling does with yarn. After the iPhone case was complete, she expanded on her knowledge to create a coin purse for one of her friends. I am continually amazed by what kids can accomplish when given time and space to follow their interests. They can be very focused and motivated. My daughter assembled a photo album of creatively edited photos. Earlier in the year she improved her computer skills by Photo Editing several images using gIMP. Phase 2 of her computer improvement skills plan was to put the edited images into an album. After exploring several options together, we decided to use iPhoto to create the album. Stepping outside the comfort zone is extremely difficult for my daughter. She prefers to engage in activities which have a fairly predictable outcome. She loves to read books, dance, sew quilts and play the piano. Although some time in the past she learned these activities, now they are predictable. She continues to improve in all four, but the steps for improving are known and repeated. Getting her to explore new activities is a challenge. Therefore, I was thrilled when after only a suggestion, the photo album creation idea was underway. Because she was so motivated to complete this project, the results are outstanding. The photos are personal and each show her unique creativity. A similar project could be completed by children with a wide range of interest areas. If you do or have done something similar, I would love to hear about it. We made scratch art Gustav Klimt trees. Gustav Klimt was an Austrian who painted in the Art Nouveau style of the late 1800's. He was influenced by the Byzantine churches of Venice and Ravenna which contain lots of gold within the artwork. 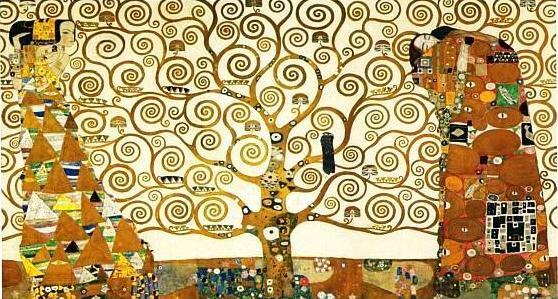 His favorite subject was the female body and much of his work is not really appropriate for children..... but his Tree of Life, full of gold and swirls is a fun work for kids to imitate. When I was a kid I remember enjoying creating my own scratch art paper, so we combined Gustav Klimt's Tree of Life with the scratch art style to create a fun and unique art project. First an entire sheet of paper was colored with wax crayons. Next, the paper was completely covered with a black oil pastel. Any sharp tool such as a toothpick or paper clip could be used to scratch off the black oil pastel revealing the colorful hidden background. We used the rounded end of paper clips. After scratching thin lines with the rounded end of a paper clip, the lines were widened to show more of the background. Paracord is a type of versatile nylon cord popular with the military and with survivalists. Woven into bracelets and belts, soldiers and civilians can unravel the cable if and when it is needed. Recently, crafters have discovered paracord which has increased its popularity. My daughter likes paracord more for the crafting/fashion aspect, but even for her, it may come in handy. The book Paracord Fusion Ties - Volume 1: Straps, Slip Knots, Falls, Bars, and Bundles is a good place to get started constructing paracord strips. It begins at the basic level and is full of color photos to make understanding the steps easier. There are many different ways the cords can be woven together to create wider strips which can be worn as belts and bracelets. For more craft projects please check out our Arts and Crafts page.